EMDR Elite has the most innovative, yet simple systems for your therapy sessions. 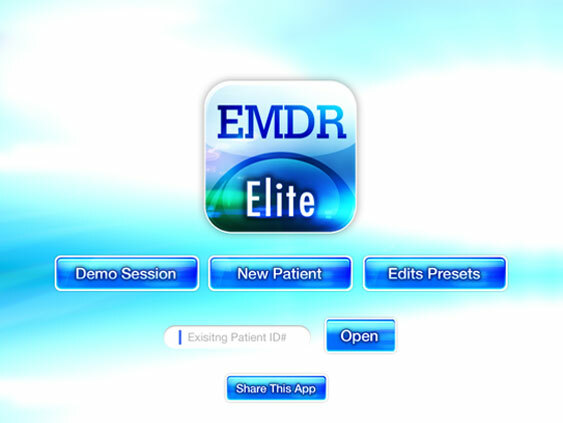 From the first Elite panel you can immediately run a demo of the EMDR light process, set up a patient and save preferences, or edit your saved patients’ settings. 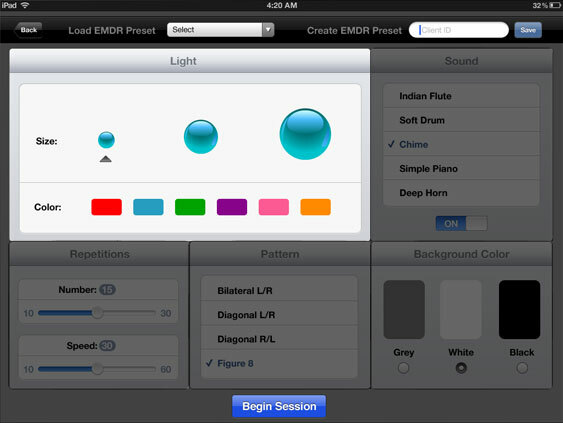 EMDR Elite offers the therapist the widest range of light color choices of any app or light bar on the market. Let your client choose the color that is easiest and most comfortable for him/her to follow visually. 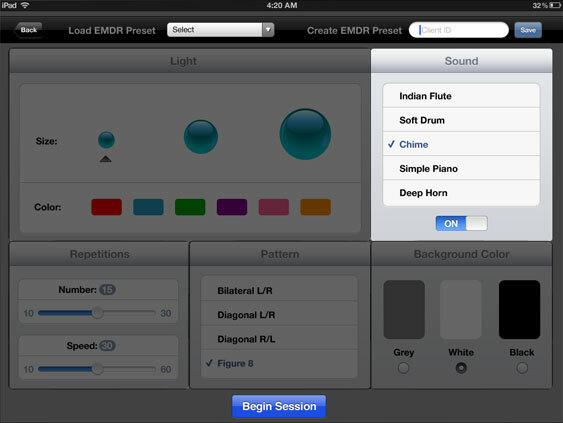 The only EMDR app that offers a wide range of sound choices for additional bilateral stimulus. Sound options vary in both pitch and quality to respond to individual responses to different types of sounds. Each client can select a sound that will create optimal focus and responsiveness without being overly intrusive. Therapists can change sounds at any time based on a client’s response to the sound. Set and save light movement speed and set length to meet each client’s ability to comfortably follow lights. 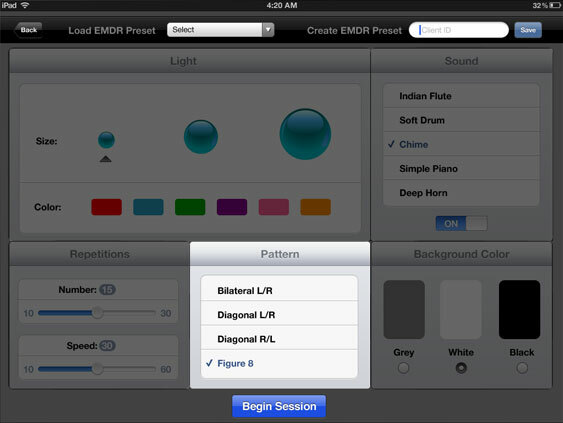 EMDR Elite is the only app on the market that makes it possible to change light movement patterns when clients become “stuck” during processing. Before EMDR Elite, only using fingers for visual tracking or purchasing expensive computer software requiring therapy clients to sit in front of a monitor, have offered this flexibility. Change background colors to maximize client’s ability to easily follow lights, based on individual preferences. Save set-up time in your client’s next session by saving your clients “Presets” from the last session. You can edit Presets anytime for any client and save the new settings. Designed with a licensed psychotherapist trained and experienced in the use of EMDR, this app has features that EMDR therapists will find uniquely helpful. 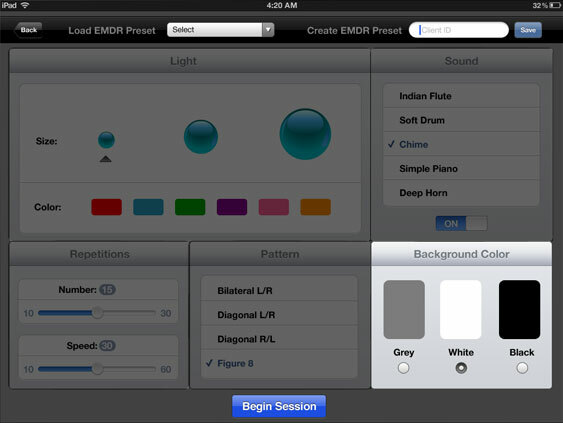 The only fully customizable EMDR app on the market: Choose from a variety of light colors and sizes and change background colors for ease of visibility, choose from a variety of sound options, choose speed and length of sets. 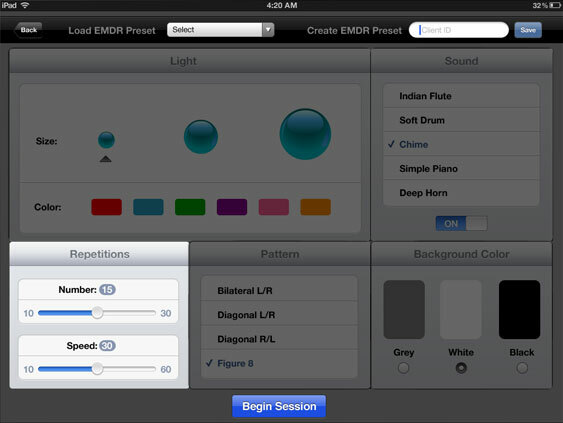 The only app on the market that maximizes efficient use of time in sessions by allowing therapists to save clients’ setting preferences in Presets for ease of set-up in later sessions. Frees therapists to take notes during sets and reduces arm muscle fatigue for therapists accustomed to using the two-finger method as the visual tracking focal point. EMDR Elite saves time by providing an easy two-click start process for beginning sessions once preferences are initially set and saved. 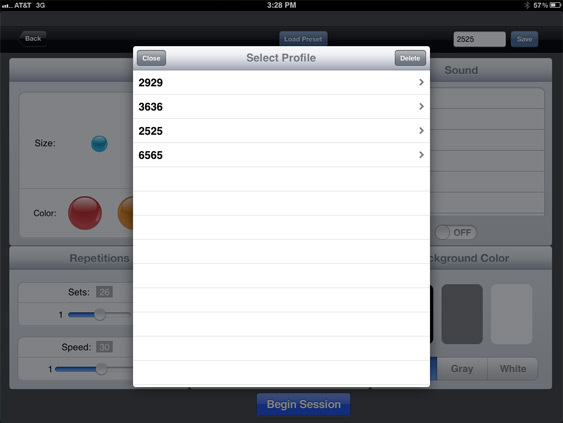 Includes a “Demo session” setting to familiarize your client with the application before you begin therapy.